The Diocese of Los Angeles, under the auspices of His Grace Bishop Serapion, and the Muslim Public Affairs Council jointly issued a statement on September 17, 2012 responding to the tragic film, The Innocence of Muslims, and the subsequent violence and persecution. 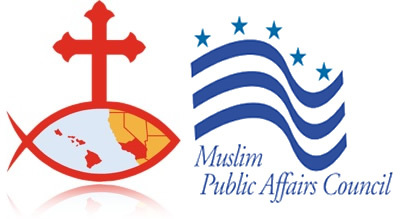 We collectively condemn desecration directed at any religion, namely the anti- Muslim film “Innocence of Muslims.” We strongly reject any humiliation or ridicule directed at the tenets or the respected figures of any religion. We strongly condemn any and ALL violent reactions and the loss of innocent lives. Along with our Nation we mourn the deaths of the US ambassador to Libya and his staff and offer our heartfelt condolences to their families. We condemn any attacks against religious communities, Coptic or Muslim in particular, both in Egypt and the United States. Harming one another serves only to escalate tensions and hatred among our communities. Living in the United States and inspired by its values, we are capable of a more reasonable approach that living in a free society demands of us. Further, we cannot allow the actions of a few deceived, fanatical individuals to define our communities. Those individuals are responsible for their debased actions, which cannot be reflective of the respectable communities they claim to be members of. Responding with violence only serves to continue the hate, rather than taking positive steps to start the healing process. We are strongly committed to respectful dialogue to bring about understanding and peace. We call on members of both religions to lean on our faiths to counter the hate and violence with good speech and positive work. That is why we are here together today. Our communities must continue to strive and take reasonable and practical steps to allow healing to begin. You may read the statement at the link below.